In the early 1960s, the US Navy held a competition to develop a light attack aircraft with better avionics and payload capabilities than the A-4E Skyhawk. The Navy threw in a catch - the design must be based on an existing aircraft in order to expedite production. Ling Temco Vought (LTV) was the winner with their A-7 based on their successful F-8 Crusader. To facilitate the A-7, LTV designers stripped off several key features of the F-8. The F-8's afterburning J52 was replaced with the more fuel-efficient TF30 turbofan, eliminating the extra fuselage length for the afterburner section. Since the aircraft was therefore shorter, the variable incidence wing was eliminated as tail ramp strike wasn't as much of an issue. As the aircraft was subsonic, the hump behind the cockpit which was an area rule 'bandaid' applied to the F-8 was no longer necessary. Six weapons stations were added to the wings while the A-7 retained the F-8's fuselage-mounted Sidewinder rails. Of course, on paper these changes were a simplification of the existing F-8 design, but in production, the A-7 Corsair II was a new aircraft. Aircrews dubbed the aircraft the SLUF - Short Little Ugly 'Fella'. 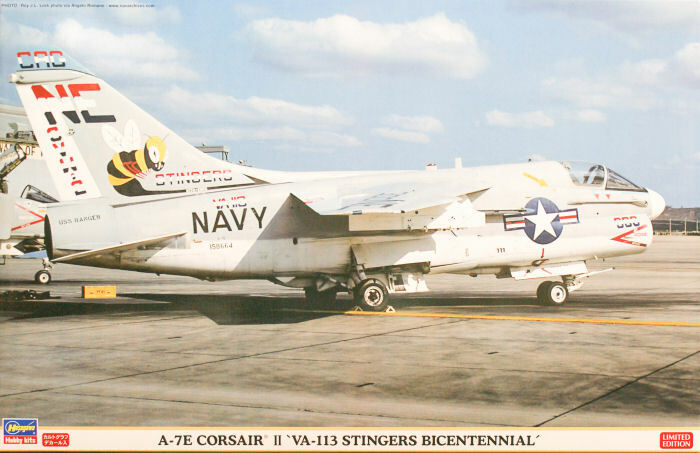 The A-7E was the final US Navy single-seat development of the Corsair II family. It received an improved-thrust TF41 engine, replaced the two 20mm cannons with a single M61 Vulcan 20mm gatling gun, and featured updated avionics. The A-7 saw combat early in its operational life over Vietnam, and ended its career over the skies of Iraq during Operation Desert Storm. It even had the distinction of tapping a Libyan SA-5 SAM site with HARM missiles when a pair of SLUFs crossed the "Line of Death" in the Gulf of Sidra to pay their respects. The A-7 was in the process of being phased out of service in favor of the F/A-18A Hornet when Operation Desert Shield/Desert Storm were happening, and the two squadrons that flew the SLUF with great combat results in Iraq transitioned to the Hornet on their return home. Here is one of my all-time favorite kits from Hasegawa. I built this kit a number of years ago ( look here) and the model literally falls together. The tooling of this kit falls nicely between the old-school raised surface details and the current approach of modular inserts to render different versions. This kit features finely scribed detailing and is not complex to build. As with many of their great subjects, this tooling is subject to periodic reissues with various features/decals to make the kit unique, and this one is no exception! One note is that you'll notice a touch of flash starting to appear on some of the parts, so a little extra clean-up may be needed during assembly as these molds are indeed starting to show their age. This is still one of my favorite kits from Hasegawa. Considering that the A-7 has been produced in 1/48 with an early kit from Aurora, the 1/48 A-7B by Monogram, several 1/48 variants from Hobby Boss (and their larger 1/32 A-7D and A-7E cousins from Trumpeter), I still have to give the crown of best SLUF in any scale to this 1/48 A-7E and its companion 1/48 A-7D from Hasegawa. My sincere thanks to Hasegawa USA for this review sample!